Gamblogger: Really -- 620 Free Spins on Lucha Libre!? Ole! 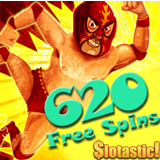 Really -- 620 Free Spins on Lucha Libre!? Ole! Lots of online casinos give free spins on new games when they first come out. But 620?! Really!?!? I've never seen anyone offer that many! Grande Vegas Casino will give you $125 to try the new Lucha Libre TV wrestling theme slot game and Springbok Casino is offering R1500. But Slotastic's offer is incredible! Until the end of May, you can get 20 free spins on the new slot every time you make a minimum $20 deposit and enter coupon code MAYSPINS. Claim 20 free spins every day in May, if you like, for a total of 620 free spins on the hilarious new game. "Our April free spins offer was really popular – lots of players claimed LOTS of free spins on Crystal Waters," he said. "We've been having a good laugh over this new wrestling game. And players seem to be hitting the bonus features quite frequently so they're really enjoying it too. " If you're new at Slotastic you can also claim an up to $177 Welcome Bonus that includes 100 free spins on Lucha Libre. Use coupon code LUCHA100. Claim these bonuses in the online casino or the mobile casino until May 31st 2015.Complete contest details.